Greetings friends and fellow crafters. 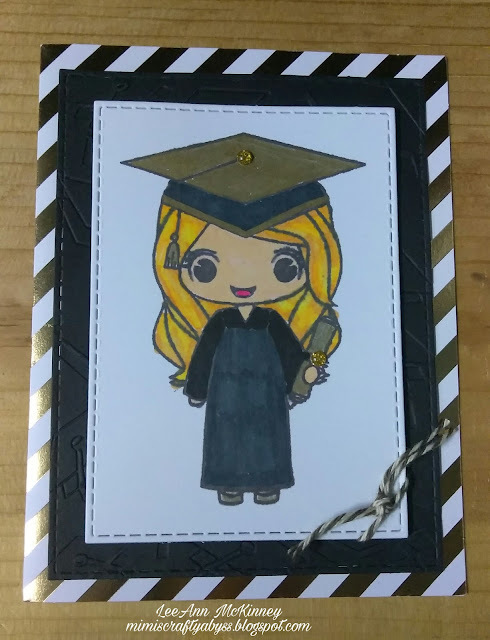 It is June and many great kids have graduated this year, I made this project in honor of all of them, Ashley (college), Taylor and Brianna (high school), Dominic (pre-k) and most of all my daughter Megan and her fiance Danny who will graduate from College in August. This color is made not only in the colors from my daughters High School but also the University she is receiving her Bachelor's degree from. What a cutie!! I have several SA stamps, but not this one - love what you did with Annie! And congrats to your graduates! Hi Lee Ann - what a cute card!! I appreciate you playing along with the first Tic Tac Toe challenge and fantastic news about the graduates! This card is so cute, Lee Ann! You sure do have a lot of graduates right down to Pre-K...love that! So happy you joined us at the TTT challenge. LeeAnn this is so sweet! I love this girl and her big eyes! Love the way you coordinated the colors for your daughter's high school and college! Thank you for playing with us for our first Tic Tac Toe Challenge!